I must confess to being a little out of touch with what Fu Manchu have been up of late, especially after their disappointing ‘California Crossing’, so it was a pleasant surprise to stumble upon ‘Start The Machine’ while browsing through the metal section in HMV. Yup, you’ve guessed it, the soft spot I have for this band got too much and before I knew what was happening, I’d joined the queue with said CD in one hand and cash in the other. So what does this Californian quartet offer us with this latest release? Well if I’m honest, not a lot, actually that’s a little harsh as it kicks off with the classic sounding Fu Manchu track ‘Written In Stone’, complete with the now trademarked Fuzzed Out ‘n’ Groovin’ guitar, backed up with solid bass and drums (courtesy of new recruit Scott Reeder) and finished with Scott Hills instantly recognisable laid back vocal style. The trend continues with ‘I Can’t Hear You’ & ‘Understand’ but as you flow from track to track you can’t help think that they’ve lost there way somewhat with the rest of the CD sounding a little stagnant, like they’re struggling to find new and fresh idea’s, with the exception of track 7, which is an expertly pieced together instrumental with a spacey and tripped out feel aptly entitled ‘Out To Sea’. 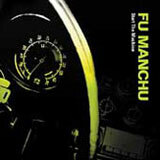 Don’t get me wrong, this isn’t a bad album, in no time at all I found myself tapping along to tracks that are obviously from the Fu Manchu school of fuzz, so for that reason alone it’s a worthy addition to any die hard fans of The ‘Chu, but if your looking for an ‘In Search Of…’ or ‘Action Is Go’ part deux then you might be as good to look else where, as, although not a bad release, it just isn’t in the same league as the aforementioned albums.